This recipe is adapted from one that New York City chef April Bloomfield published in “A Girl and Her Pig.” It uses the whole onion and makes it shine at the center of the plate. Preheat the oven to 400 degrees F. Rub the onions with a little olive oil and sprinkle with salt. Put the onions in a single layer in an ovenproof pot with a lid. Place the garlic head in the middle of the onions and drizzle it with oil. Scatter thyme sprigs over onions, then add ¼ cup water to the pot. Cover and roast in the oven for 50-60 minutes, until the onions are lightly browned and soft enough so a knife slips easily into their centers. Set aside until cool enough to handle. Carefully lift the onions onto a cutting board, leaving the liquid in the pot. Scoop out a few layers from inside each onion and add those bits to the pot. Stuff each onion with 2 tablespoons of sausage meat. Squeeze the soft flesh of the garlic cloves into the pot, and add the thyme leaves, cream, 1 teaspoon salt and 3/4 cup water. Bring the mixture to a boil over high heat, add the stuffed onions, sausage-side up, and baste them with the liquid for a minute or so. Return the pot, uncovered, to the oven and cook until the sauce is thick, but not gloppy, about 40 minutes, basting the onions every 10 minutes or so. 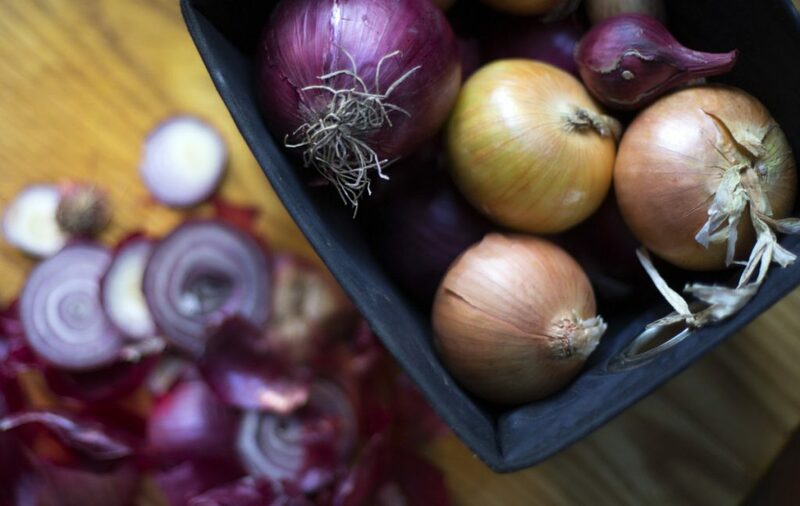 To serve, bring the pan to the table, spoon a little of the sauce over the top of each onion and dig in.